It goes without saying that in leaner economic times, restaurants need to be even more competitive, and distinguish themselves with memorable experience to ensure repeat visits. 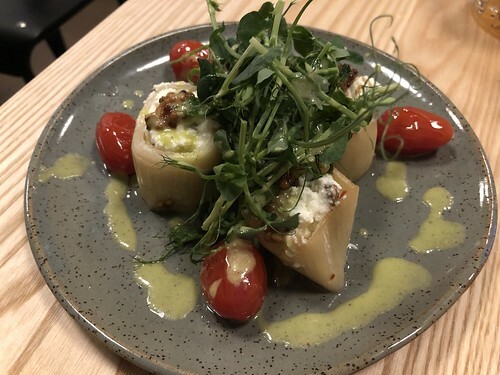 A meal at one of Edmonton’s newest eateries, Aarde, left me wondering if they will be able to stand out amongst the increasingly crowded dining scene Downtown. Mack and I happen to live in the same building as Aarde, and after seeing multiple tenant turnovers and long vacancies in the ground floor space, really want the restaurant to be successful (it is an unfortunate reality that there is a glut of prime, empty streetfront retail bays Downtown). Aarde, which means “earth” in Dutch, opened in November. It was opened by Chef Guru Singh who wanted to bring the best of the European dishes he sampled to Edmonton. I like the aesthetics of Aarde – neutrals, clean but modern furniture, and some plant accents. The layout of the tables doesn’t necessarily maximize the space, but I appreciated some room to breathe. That night it didn’t matter though, as we were just one of two parties that late Sunday evening in December. 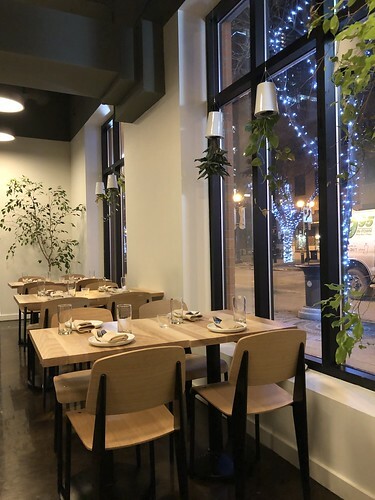 After we were seated, my first impressions weren’t positive – the candle on our table was left unlit, and dried leaves that had fallen from a nearby plant had been left on the floor unswept. Although these were small details, and perhaps not intentionally careless, it communicated an ambivalence that felt surprising for a brand new restaurant. It’s also strange to me that Aarde has yet to adopt (even now, in January) any signage indicating that they are, in fact, open – the closest they’ve come is putting out a sandwich board advertising weekend brunches served from 10am-2pm. With some guidance from the server, Mack and I decided to share four dishes. 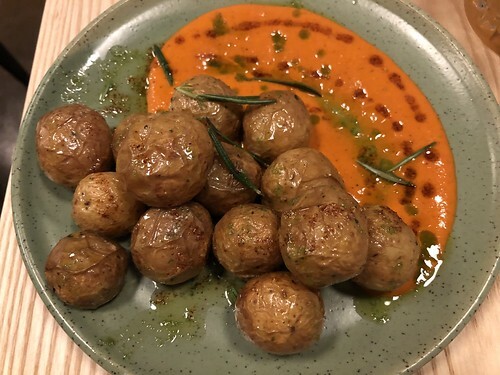 The roasted potatoes ($11) were a pretty standard dish, but ended up being our favourite – perfectly cooked, with a nice level of spice in the aioli. Mack wished we had been told beforehand that the confit leeks and tomato ($10) were served cold. While the ricotta date stuffing was enjoyable, we found that the leeks themselves were tough and hard to eat. 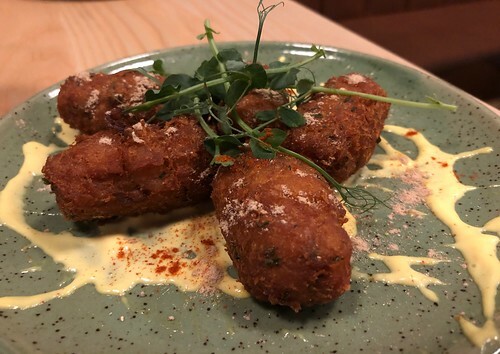 The bacalao fritters ($14) weren’t quite executed as well as they could have; the batter tasted almost gristly in texture, though the fish within was well seasoned. The dry mango powder, which sounded interesting on the menu description, was not discernable. The presentation of the beef ribs ($24) left something to be desired. 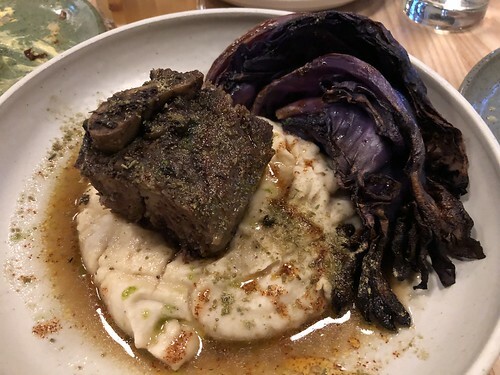 That said, we liked the charred cabbage bits, and the creamy celeriac, but what should have been the star of the plate was not fall-off-the-bone tender as we would have expected. We’ve found that chefs at most chef-owned restaurants make their presence known, especially in the early days. So Chef Singh’s absence was even more conspicuous that evening. While I’m not certain it would have made up for an overall disappointing meal, it was evident that more care and oversight was needed in the kitchen and the dining room. I have heard more positive things about Aarde’s brunch, however, and with the restaurant being so close to home, I do want to give it another chance. Only time will tell if the dining public feels it is a worthy addition to the food scene.